Add visibility to Agile software testing without disrupting existing technologies. Integrate with data from your various ALM/software testing tools across multiple projects. QACube delivers complete visibility and transparency with information covering the entire software testing process. Where it used to take weeks to generate consolidated reports from the different testing tools, with QACube the reports, graphics, dashboards and wizards are dynamic and always available to anyone who needs information regarding the quality of the software being tested, along with the testing progress and much more. QACube is already integrated with popular ALM/software testing and development tools such as Bugzilla, CA Agile Central (formerly Rally), GitLab, HP QC Enterprise, JIRA, Microsoft Excel, Microsoft Team Foundation Server, Tasktop, Tricentis Tosca, SonarQube, Spira Test, XML, Xray and others. Empower your team to provide consolidated reporting from multiple testing systems simultaneously. 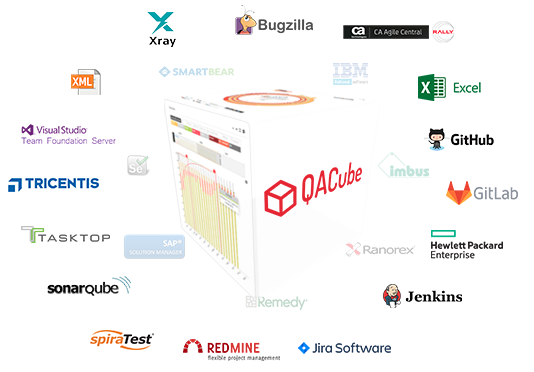 The QACube platform is already integrated with the latest, most powerful software testing and defect tracking tools. Our experts can propose a solution that includes graphics, dashboards and other visual analytics to meet your exact requirements. Software testing information flows in automatically from across all projects, while everyone involved in software quality assurance including management and key stakeholders gain end-to-end visibility and traceability.